is makuri. In this case it is the only move to kill White. 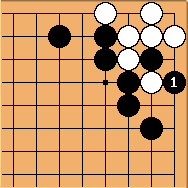 In general, makuri involves giving atari in a case where the opponent can immediately take one of the stones involved in the atari, but you can then pull out the stone giving atari, or sometimes connect it underneath on the first line (a common endgame tesuji, example needed). Does anyone know where else in SL this is documented, or if an English name has ever been invented? John F. This is hardly a technical term, surely? It's just a metaphor. If you saw the English phrase "Black curls back" you wouldn't assume curls back was a technical term. Jargon has to be common currency among the adherents. This is not. Also there is a strong disposition anyway in Japanese to avoid transitive verbs as technical terms. That said, it would be useful for such common tesujis to have a good English name, so I hope this page can stimulate that. BobMyers Here (dead link) is a page in Japanese talking about makuri. This word also seems to be used to describe guru guru mawashi. I'm not sure what this being or not being a technical term implies or does not imply. After all, you could make the case that tobi was just ordinary Japanese, but most people would agree that it is a "technical term". The fact that the book in which I saw this term gave it in katakana, as does the the web page above, could be interpreted as meaning that it is being used in at least a semi-technical way. John F. I agree it's a fuzzy area, though I'd say the fact that the several good Japanese go dictionaries I've seen don't list it is a powerful pointer. My impression would be that whilst tobi would mean something to a non-go player, it does also have a precise technical usage that is not obvious (and that's why being recognised as a technical term matters). Makuri means something to any Japanese, but I'm not convinced it has a go usage beyond the metaphorical. Since makuru in its ordinary uses is often in hiragana, the use of the word in katakana doesn't carry much weight with me, either. The site mentioned seems to have put itself in the position of needing a word for a title and chose a metaphorical one faute de mieux. A fairly good one, and I approve of trying to find new names, but elevation to the technical lexicon has to be earned only after sufficient numbers of people agree on their definition. Still, maybe we are witnessing the birth of a new star, starting as you say with at least a semi-technical intent. unkx80: While we are at it, can someone please put the Japanese characters in? Personally, I am not sure whether there is a specific Chinese term for describing makuri. Speaking about the list of Chinese Go terms on SL, there are a number of terms that are used in real life and have no specific meaning when applied to Go. BobMyers It's 捲くる. One common usage is to roll up your sleeve. Translations include turn up, bend up (one end of something), tuck, etc. Since "turn" and "bend" are confusingly similar to other established go terms, maybe something like "roll around" or "tuck (around)" would work.